Have you ever thought of Trampoline Day Camp? 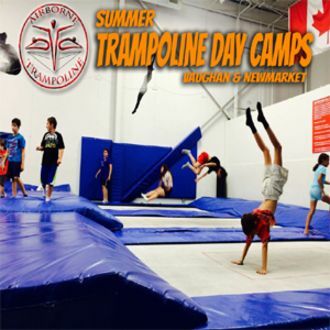 Summer Trampoline Day Camps at Airborne Trampoline! The hottest thing to do in Vaughan and Newmarket! Since 1994 Airborne's Trampoline Camp has been packed with high flying fun, trampoline games, trips, and fantastic & fun exercise. Each 9am to 5pm camp day includes up to 2-4 hours on Airborne's Olympic size, high performance trampolines, and in Airborne's JumpZone Trampoline Parks 30+ trampolines (Newmarket Location). Airborne's Trampoline campers get to join in trampoline lessons, games and learn new skills. Airborne's Trampoline campers also participate in arts & crafts, general sports, and a special activity of the day/week (see specific camp schedule for more info). Airborne's Trampoline Day Camps use school bus transportation, and employ experienced, Gymnastics Ontario, N.C.C.P., & First Aid Certified counselors. Jump over to Airborne's website today for more information, detailed activity schedules, and online registration! Summer, March Break, P.A. Day & Christmas Holiday Trampoline Camp available! Airborne's Summer Trampoline Camp Is Live! Airborne Trampoline Camp's Newest Counselor! Only 2 Days Until Airborne's P.A. Day Trampoline Camp!